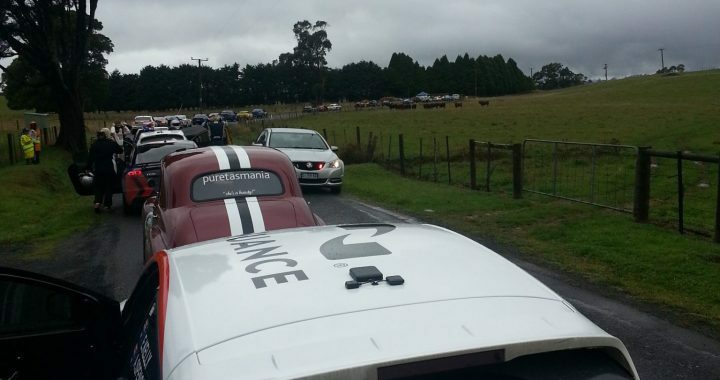 Day 4 was a challenging day for all of the Targa field, the conditions were cold, wet and very slippery. The test proved to be more and more difficult for some with more than 30 cars failing to complete all of the day’s stages. The two car team of Redback Racing survived the conditions with Andrew and Lee continuing to dominate the Showroom class. Adam and Erin, after suffering a significant time penalty on day one after an off are in third place. Tomorrow is the last day of the gruelling 5 day event where crews drive the 60km Mount Arrowsmith stage after having left the west coast of Tasmania en route to Hobart. Posted in 2013/14 Season News and tagged 2014, Adam Spence, Andrew Bollom, Erin Kelly, Lee Challoner-Miles, Megane, Redback, Renault, result, results, Targa, Targa Tasmania, Tasmania, TT, TT14.